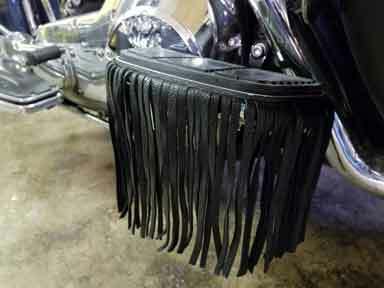 Home > Lutzs Motorcycle Leather Products > Floorboard Fringe > Rear Floorboard Fringe 8"
Fringe For Rear Floorboard All Leather. Sold as a Pair , 1 for each side 8 inches Long fringe. Fits Harley rear floorboards (pictured) MUST have chrome cover to work. 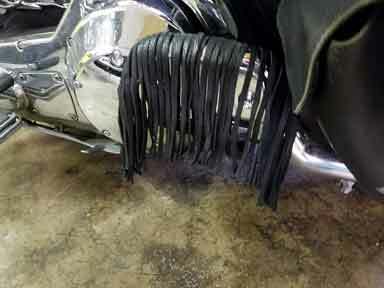 Leather that holds fringe goes in between chrome cover and floorboard. Usually fits Heritage softail, Roadking and Dressers FLHT. 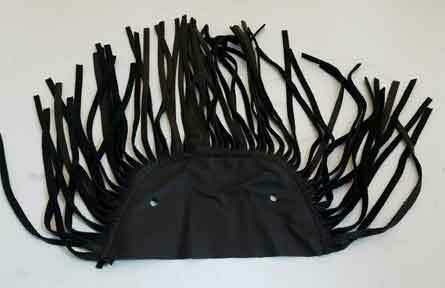 Made by Lutzs Leather, USA, Pa. Leather for fringe is cut out of chrome tan 3/4 oz cowhide, grain can vary. Chrome cover Not included in this page.